WIZARD’S BREW RECIPE IN PROJECT #3 I used to think science was above the heads of preschool aged children until I became the science parent at my children’s coop preschool and saw just how wrong I was! Some of the best preschool activities are science related. 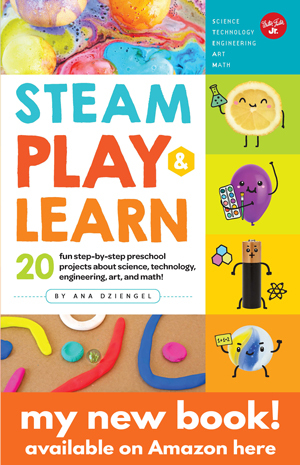 Preschool age children are inquisitive and open-minded, perfect traits for budding young scientists! Science at a preschool level is a lot of fun, kids are truly mesmerized by chemical reactions, love exploring nature, and jump to build things. [clickToTweet tweet=”when it comes to preschoolers and science, let observations speak for themselves!” quote=”When it comes to preschoolers and science, let observations speak for themselves!”]. Adults can make these fun tube toys for kids to play with and demonstrate viscosity. Click here for the full project. This project is very popular on the internet and I can see why. 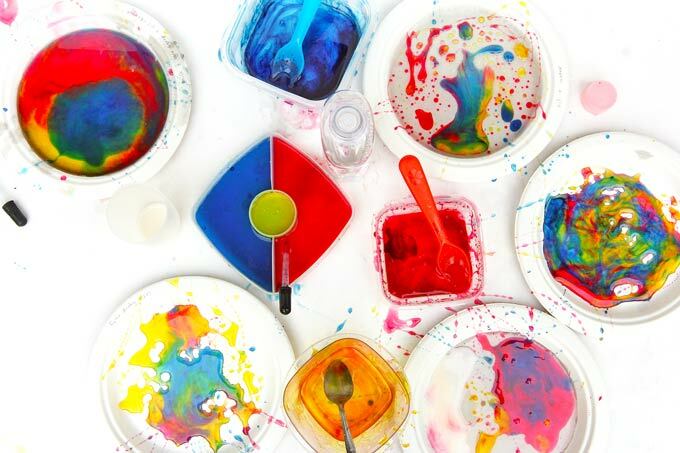 The combination of milk, dish soap, and food coloring makes for some color swirling magic! You can even dip paper in the milk to make a milk “print” to keep! See how we did it here. The basic recipe for this is originally from The Usborne Big Book of Science Things to Make and Do, a book I highly recommend you have in your library, there are many more fun ideas like this one! We modified it to give it a rainbow twist! Fill the jar halfway with vinegar, then add a few drops of one color of liquid watercolor /food coloring and some glitter. Squeeze in some dish soap, stir, and place the jar on a tray. Now have your child add in a heaping teaspoon of baking soda, stir again, and watch the foaming begin! The soap makes it foam rather than fizz. To keep the reaction going continue adding baking soda and vinegar when the foam starts to slow. To make it change colors, add a tablespoon of vinegar mixed with one color of liquid watercolor/food coloring every so often. Make sure to dump the colored vinegar into the center of the brew. Tip: Stir It! My kids discovered that the more they stirred the mixture the faster and crazier the reaction! Did you hear the screams of delight in the video? This was one of our school year’s all time favorites for parents and kids alike. Check out this post for the full directions! It will take a few days for the glue to dry but then the box can be hung on the wall like a picture! These can be made with any number of “adhesives” meaning any type of nut butter or in this case Crisco! See our full tutorial here. Fill a clear plastic container with metal objects. We used nuts and bolts, pipe cleaners, bobby pins, brads, and paper clips. Hand your child a strong magnet and let them experiment with lifting the objects in the container without touching them. It’s magnetic magic! A great tutorial for making these is on What Do We Do All Day. AKA slime made with cornstarch and water. This is so much fun, even for the parents! It is very messy so please do it outside or in an easily cleanable place in your home. Add colors to the mix for swirling magic! Punch holes near the edges of a small paper plate or plastic lid. Tie yarn through the holes (have your child feed the yarn through the holes for a fine motor skills bonus), then gather and tie the yarn at the top as if this is a hanging plant. Have your child pick some flowers and tape them to the yarn. Add a piece of fresh fruit in the middle of the plate, pour a little juice on top, and hang in a place where you can see it. Admittedly it rained the day after we made these at school and our poor feeder was pretty thrashed, so I never saw a butterfly actually visit it. But most of the fun is in the making! Super simple project you can do with a couple of items from your pantry. Mix water with baking soda in a clear glass or cup, and add a few small pieces of spaghetti to the mix. Then add vinegar. Bubbles will form on the spaghetti and make it “dance.” Additional instructions can be found here. Another classic experiment. Fill a large bowl, kiddie pool, or water table with water. Collect a variety of objects that sink and float. Make sure to collect objects that are similar in size but vastly different in density, like a rock and a tennis ball. Ask your child to predict whether the object will sink or float and let them drop it in the water. Have your child classify them into two different stacks, the “Floaters” and the “Sinkers.” Sounds simple but trust me, it’s a hit with preschoolers! This is a classic experiment and one that easily pleases preschoolers. Collect dirty tarnished pennies and have the kids soak them in a bowl of vinegar. Within a minute the pennies will be instantly “shined”. For an added bonus, rinse some of the pennies in water after the vinegar dip and then compare them to the vinegar only pennies; if you wait an hour the vinegar pennies will start to oxidize and turn green. VARIATION: Experiment with other solutions to shine the pennies. You can try salsa (the acid in tomatoes also acts to clean the pennies), lemon juice, soap and water, and vinegar and see which one works the best. Growing things is a very important lesson. I have done two variations on this project, one using cardboard egg cartons and the other using ziploc baggies. The ziplock bag yields the more interesting visual results and the egg carton version makes plants that are much easier to transfer to soil down the road. ZIPLOC VERSION: For the ziploc version buy a variety of seeds, beans and corn work well since they are large and easy to pick up. Give your child a folded wet paper towel and have them drop a small amount of seeds on it. Try to leave some space between the seeds if you actually want to plant them, otherwise the roots will tangle. 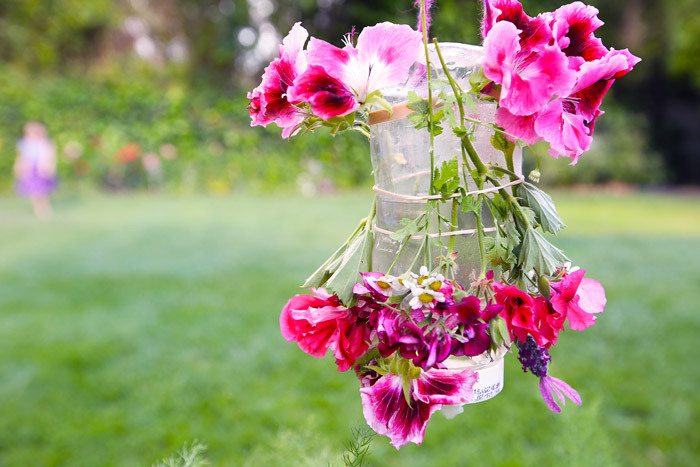 Place the paper towel in a small ziploc bag and hang the bag in a sunny window or outside in a sunny spot. Within a few days the seeds will germinate and the roots will be visible. EGG CARTON VERSION: We love this method because the egg carton cups can be transferred directly to the soil. See how we did it on PBS Parents. Another favorite by all! Don’t throw away your paper towel and toilet paper rolls, use them to make a marble run! 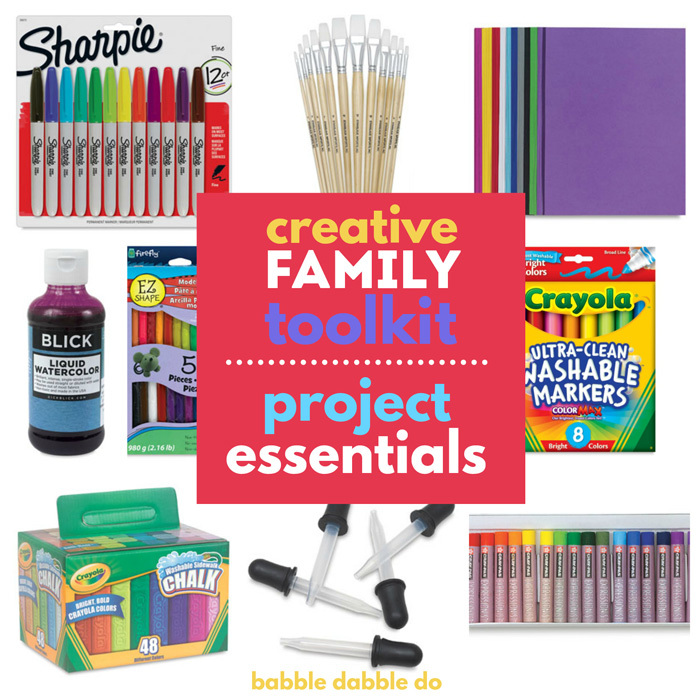 This is great collaborative project for kids. Have children sit in a circle an invite them up one at a time to add and test a section of the marble run. Kids love scavenger hunts. Period. If you take the time to set up one related to a specific idea it can be a learning exercise. Since preschoolers for the most part can’t read, I create visual lists with images pulled off the web. For a recycling themed scavenger hunt I divided up items into three categories: compostables, recyclables, and trash. Then I hid these items around the school and gave each child one of the lists attached here: Recycling Scavenger Hunt Sheets. They had a blast finding the items. I re-hid them quite often so they could repeat the hunt. Magic Colors! 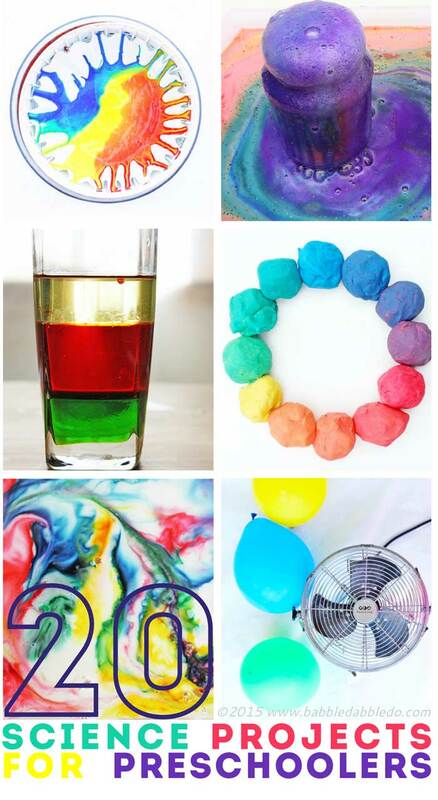 Pour water into three large bowls, then add blue, red, and yellow food coloring to one bowl each. Have an additional color mixing bowl available for your child and a dumping bowl. Give your child two plastic cups and let them experiment with taking a cupful of water from two of the primary colors and pouring them in the mixing bowl. Because the new color appears almost instantly it seems like a magic trick! Dump the third color in the dumping bowl and repeat the experiment. Using light colored or glass bowls makes the new colors more visible. Rainbow Spin Mixing Using an old salad spinner you can mix colors by spinning paint! Click here for the full project. Color Wheel Playdough Use red, yellow, and blue play dough to mix different shades of colors. Click here for the full project. This is a fun interactive project that illustrates the idea of a vortex. And let’s be honest, what preschooler can resist balloons that hover mid air? Project and video available here. What can I say, kids love mixing liquids togther! You can do this project with common pantry ingredients, messy but worth it! Instructions here. This will be either a hit or a miss in your house depending on if your child can stomach a variety of smells. Yes, there are some stinkers but also some sweet ones. It’s fun to think of things to put in the jars. An alternative is to use yogurt cups covered with a lightweight cloth or with holes poked in the lid. Then you can use actual objects in the containers instead of smells in a liquid form. Printable template and instructions here. Can you melt blocks of ice with salt and warm water? This project was a massive hit at our coop preschool and has even won over some older kids as well! Do this on a hot day! 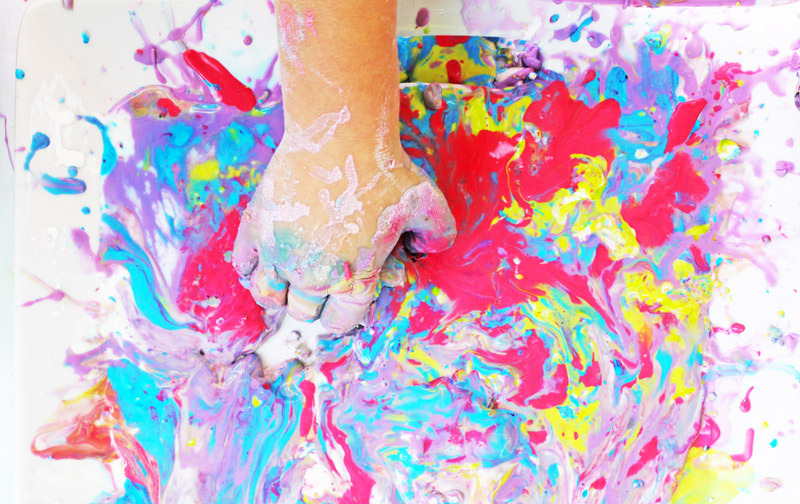 A hands-on exploration of density, polarity, viscosity, and color mixing in this messy fun art project! 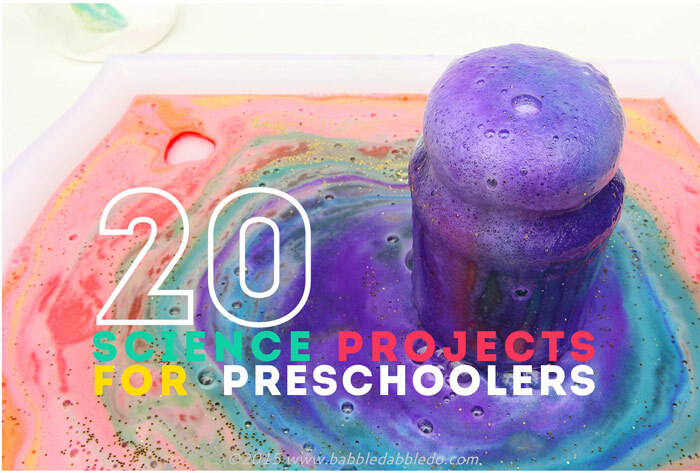 I hope you enjoyed this list of our favorite science projects for preschoolers! P.S. my older kids have enjoyed many of theses well! Love doing science with your kids? 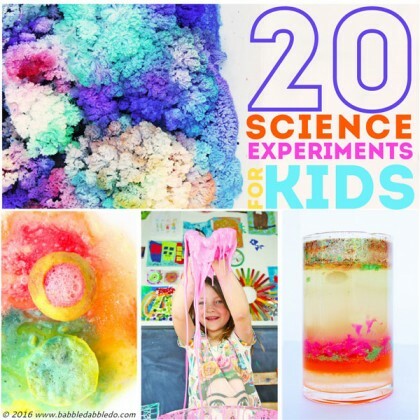 Visit our companion post 20 Science Experiments for Kids. Man my boys would want to come live with you! Talk about some fun things to do! I so need to get it on and try some of these. Thanks!! Glad you enjoyed the post Alexis! I hope your boys enjoy some of the projects! Great projects Ana! Thanks for linking up to The Best of 2012 Link Party! Hi Ana. I have a question about the wizards brew. Do the containers/jars need to be glass for the experiment to work or can a plastic cup suffice? Absolutely you can use a plastic cup. I recommend a clear one so you can see the liquids interact; also a taller one is best as once you add baking soda the whole thing grows exponentially 😉 ! Thanks for stopping by Kym! I’d love to hear how these go over with your kids! Oooh, I love all of these ideas. I homeschool my girls… it’s always nice to have a few extra ideas on hand. a question about the wizards brew…. what is dishsoap In English? Great stuff, thank you! FYI the link for nature shadow boxes does not work. Thank you for your comment, Steve Spangler is one of my favorite sites. I appreciate hearing your point of view and I always try to incorporate simple explanations into the projects I do with kids. But my primary goal in doing science with preschool aged children is getting them excited about the subject in general. I believe that a thoughtful, engaging experience does leave a lasting impression, especially at this age, and I don’t believe it to be a lesson lost. I can’t tell you how many children would run up to me excited to do a science project on Science Day because they had memorable experiences of past experiments. Thanks again for taking the time to express your point of view. Thanks for sharing! I can’t wait to try these out with my little one! These are great. I’m printing these out and saving them for my grandson. He is too young to do them now (2 weeks old), but I’ll be ready. These are really activities, and not science experiments. 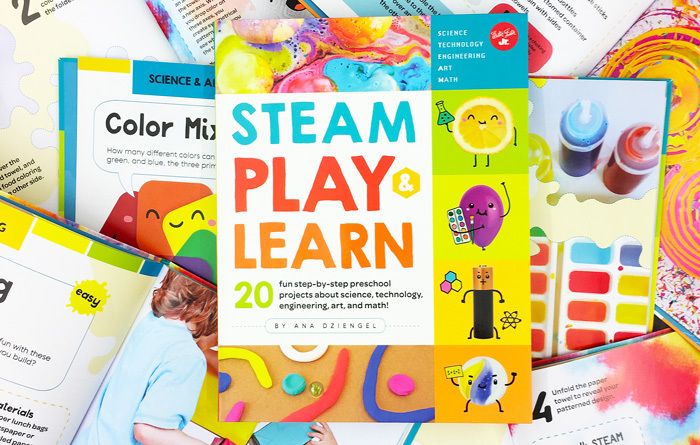 We should demonstrate to the preschoolers what a science experiment is about, which is we take our understanding a form a hypothesis then we test it and make observations, and finally we draw conclusions based on those observations. That’s science. We established the fundamental principles of chemical and physical reactions, then we discussed what we knew of the properties of combustion and we hypothesized what would happen if we replaced the oxygen in a container with CO2. The key here is to get the child to think and follow their own reasoning to come up with an understanding of why the outcome is what it is, and ways to test (not prove, but test) these hypothesis. First we tested it with baking soda and vinegar, and then we tested it with dry ice. For fun, we threw the rest of the dry ice into water with soap making crazy foam. Today, we took tarnished pennies and put them in a solution of acetic acid, hydrogen peroxide and sodium cloride. Once we observed and discussed the changes we then extended the experiment by using a car battery charger to electrolytically remove oxidization from the penny and also at the same time, plate the cathode in copper. All the while we discussed the various states of matter, what a molecule is, what an electron is and the basics of how those things interact. I gently disagree that a preschooler’s observations explain the science. Science is practice testing theory. Without theory, it’s not science. Thank you for your feedback Sean. Sounds like you are having fun with science in your home! 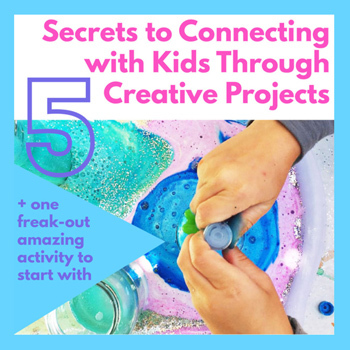 My goal with preschoolers is for them to have fun first and to encourage them to be curious. I think we have the same goal but different approaches. Would love to get the recipe for Calm Down Jars, for my autistic child.